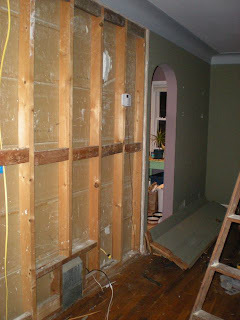 Our living room is still torn up. I spent half the day yesterday with a palm sander, going over every inch of the old paint. 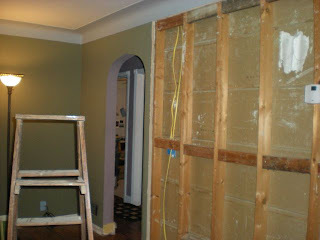 There have been so many coats of paint in that room and each one had a worse finish than the previous. So many drip marks and bumps and places where it looked like they dropped the paint roller on the floor and kept painting, not caring that there were little bits of who-knows-what in the paint. You can see a line around the whole room where it was poorly cut in. So, we’re sanding every inch of the room. Since we are painting a light cream color, every little bump and ding will be very obvious. We are also patching a ton of holes. I think we are the first owners in this house’s nearly 60 years of existence to ever patch a nail hole. I am not a perfectionist, by any definition of the word, but you can’t just paint a room without removing nails and patching holes. Because there is so much sanding and mess going on in there, we’ve cleared out pretty much everything except the dining room table and a couch. The tv and stand got moved into our bedroom and everything else is now in the sewing room. It is a dark, cold, rainy Sunday here. It is after 11am and I am still in bed; with my laptop, a book, knitting, and the tv all right here… going back to the palm sander feels like punishment.